Paris, Archives Nationales, Fonds capitulaires de Notre-Dame, LL 1140, p.156. [In the margin] “De lathomia ab domino de Rossy pictori facienda. The vaults in Notre Dame on which Rosso was to give his advice are specified as in the area of the “altaris ardentium,” which was located behind the main altar and in front of the central arch of the arcade that separated the sanctuary from the ambulatory (No. 2 on plan: Fig.Notre Dame, Paris, Plan).1 It is likely that the changes that the Chapter of Notre Dame authorized Rosso to indicate were not simple repairs to the masonry of the vaults but were part of an artistic project related to these vaults. There is no record that any alterations that Rosso may have proposed were actually carried out. But if they were then it is possible that they were related to the “ymagis supra voltas ecclesie” that he had begun for Notre Dame and, it would seem, left unfinished at his death (see also L.55, L.56, and L.58). 1 The “altaris ardentium” or “autel des ardents” was also called the “autel de la Sainte-Trinité,” and in documents the “parvum altaria” to distinguish it from the “magnum altaria;” see Guilhermy, 1856, 114; and Timbal and Metman, 1967, 116, 124 and n. 43, 125, Fig., 130 (plan, no. 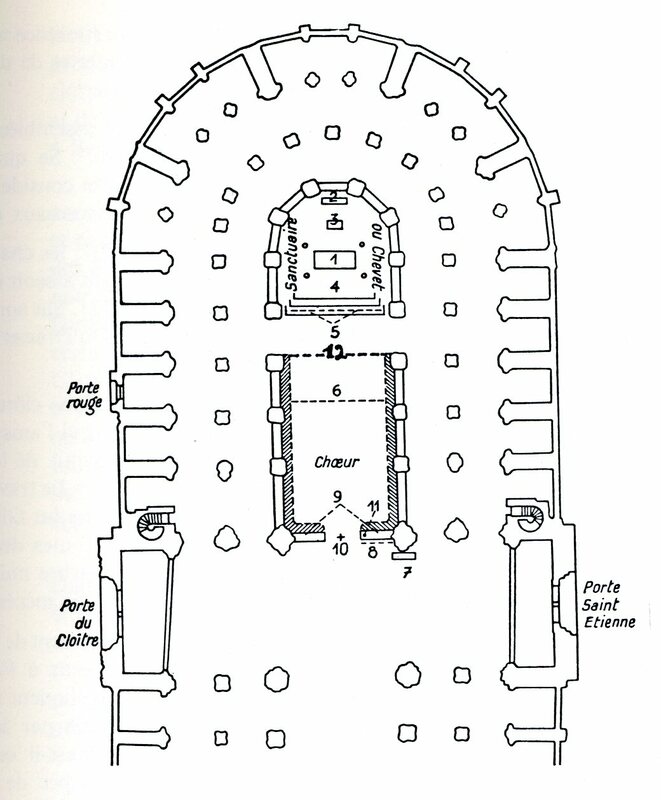 2), 129-130, who stated that it was higher than the main altar so that it could be seen from the choir stalls (see their Plate V of a drawing by Viollet-le-Duc in the Bibliothèque Nationale, Paris, which does not, however, entirely correspond to their plan). According to Gillerman, 1975, 57, it was called the “autel des ardents” because “it was here that the bodies of important royal and ecclesiastical persons lay on a ceremonial bier covered with a chapelle ardente.” On this wooden structure to which candles were affixed, see Giesey, 1960, 14 and n. 55, 43, n. 13, 44, and Fig. 11, although he speaks of a chapelle ardente erected for the funeral of Francis I in the choir of the cathedral.